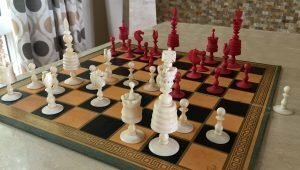 English Type II Playing Chessmen. 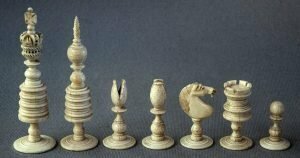 This offering is a fine example of an English Type III Playing Chessmen, often incorrectly characterized as a Barleycorn-style chess set. 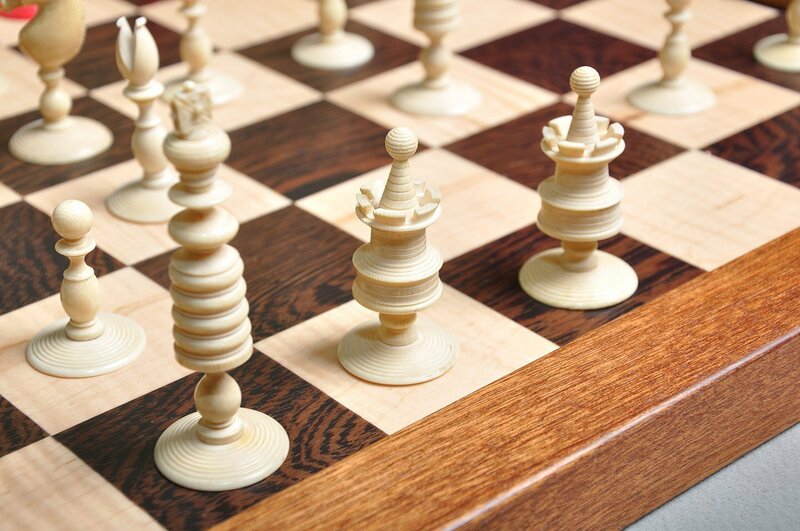 True Barleycorn style chessmen have broad barrel-bodied Kings and Queens, and are normally fabricated from bone.. 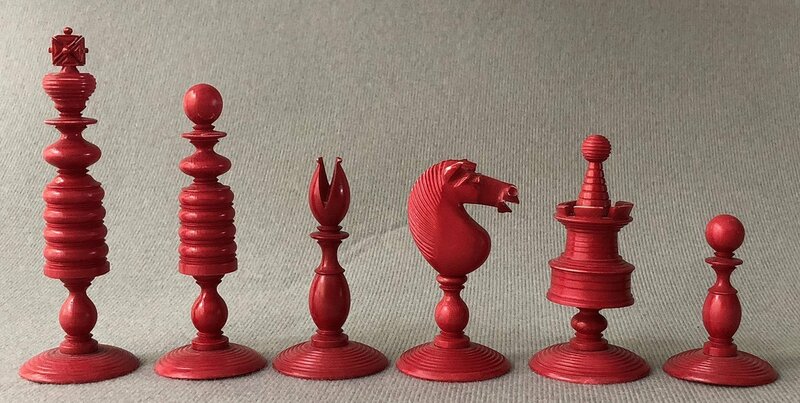 The chessmen here are natural and red-stained. 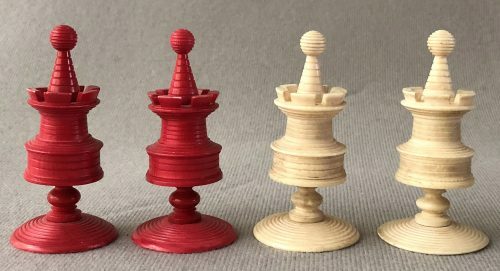 The King stands an impressive 3-7/8″ tall with a 1-1/4” diameter base. 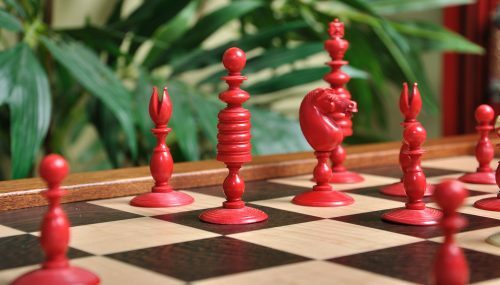 The chessmen fall in to the ubiquitous English Playing Set category, referred as Type II Playing Sets. The Kings and Queens feature well-turned narrow barrel bodies typical of the Type II design, mounted atop baluster-shaped pedestals. The King’s coronet is surmounted by a simpler cross finial, very typical for the Type II chessmen. The Queen’s headpiece is represented by a simple sphere. 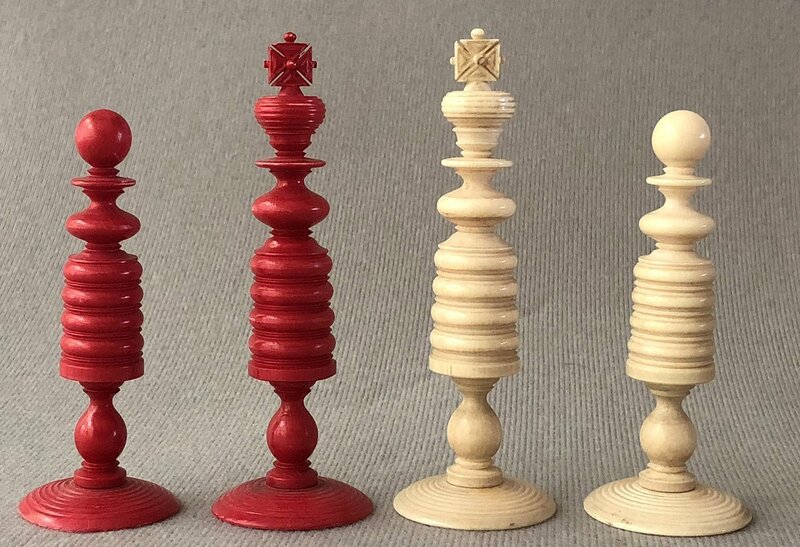 The Rooks are represented as pedestal-mounted reticulated towers surmounted with a tapered flagless staff. The Bishops, Knights and Pawns resemble styles seen on typical Barleycorn chess sets. The chessmen were produced in the early 1840s and are in excellent condition. The chessboard shown is not included with the chess pieces, but a suitable board can be found elsewhere on this site. 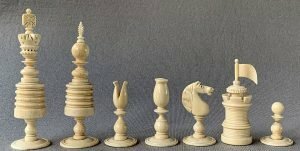 The term English Type II Playing set is used to describe a range of English Playing chess sets, primarily fabricated from ivory, and made mostly, but not uniquely, in England during the 19th century. 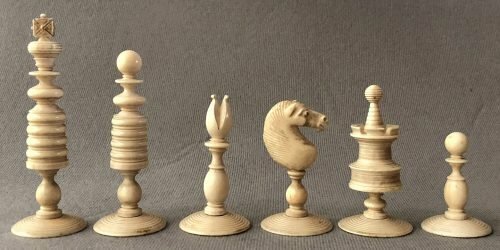 This poplar chess set design is characterized by heavily adorned, narrow, tapered, ringed bodied Kings and Queens, mounted atop baluster pedestals. The Kings will normally have reeded crowns and will lack the traditional Maltese cross or other decorative finial. 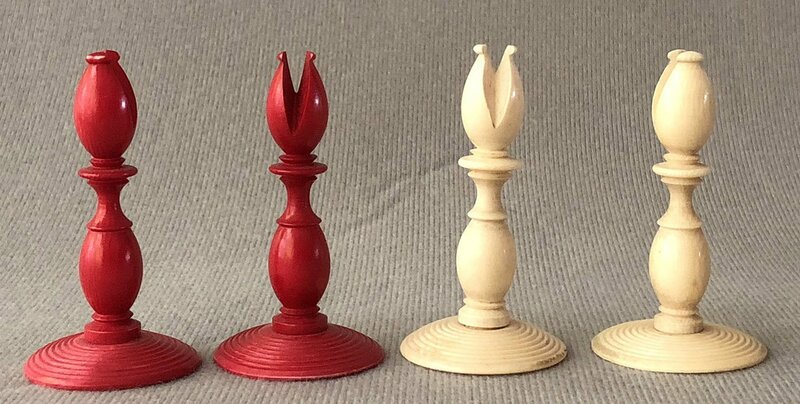 The Queens will have reeded spherical crowns, usually lacking finials. Rooks are normally stout, pedestal mounted towers, often sporting tapered staffs or secondary towers. 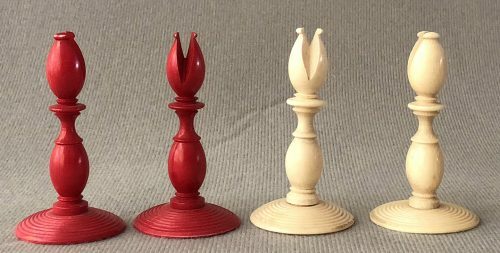 Bishops, Knights and Pawns are baluster-mounted, often reeded. Normally, the designs of the Bishops, Knights and Pawns are essentially identical to those found on Barleycorn and Type I English Playing sets. 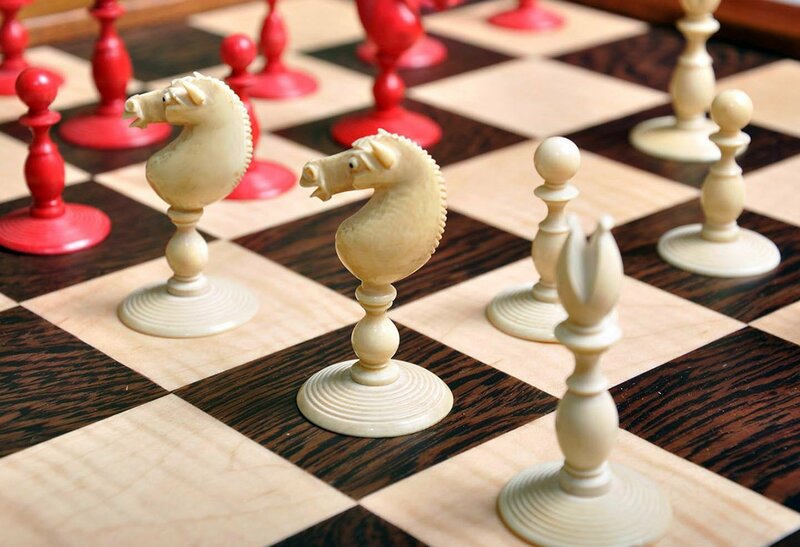 The English Type II Playing Chess Sets first appeared at the beginning of the 19th century and were in common use through the early 20th Century. 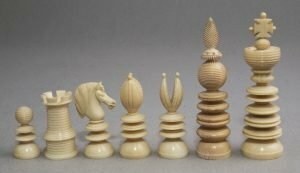 Aside from Jaques, chessmen of this type were produced by John Calvert, William and Thomas Lund, George Merrifield, Fischer, Hezekiah Dixon and Charles Hastilow, among others.